Using mechanisms adopted by birds, bats, insects and snakes, 14 research teams have developed ideas for improving drone-flying performance in complex urban environments. The research teams presented their work May 23 in a special open-access issue of IOP Publishing’s journal Bioinspiration and Biomimeticsdevoted to bio-inspired flight control. Here are a few examples. An algorithm developed by Hungarian researchers allows multiple drones to fly together like a flock of birds to improve search and rescue operations. In a test, it was able to direct the movements of a flock of nine quadcopters following a moving car. A millimeter-sized microrobot drone developed by researchers from Harvard University can take off and land and hover in the air for sustained periods of time, with a new development: simple, fly-like manoeuvers. 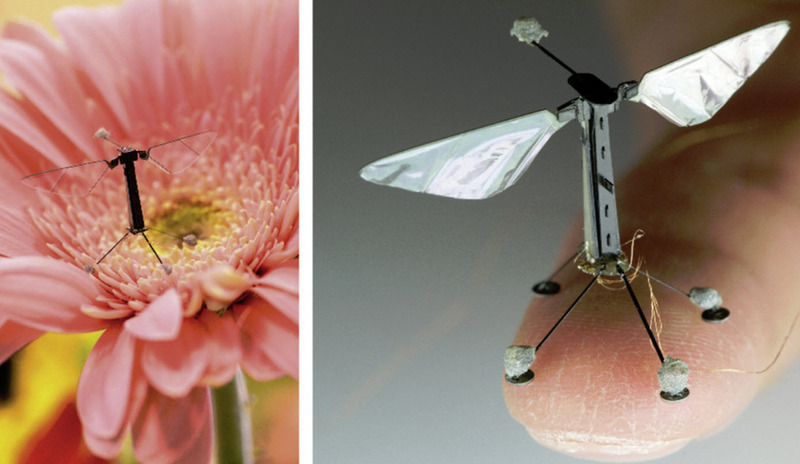 Such drones could be used in assisted agriculture pollination and reconnaissance in the future. Hawk moths that can handle strong winds and whirlwinds were developed by a research team from the University of North Carolina at Chapel Hill, the University of California, and The Johns Hopkins University. A “jumpglider design” that could reduce the power required to operate drones has been developed by researchers at Université de Sherbrooke and Stanford University. Inspired by vertebrates like the flying squirrel, the flying fish and the flying snake (which use their aerodynamic bodies to extend their jumping range to avoid predators), it combines an aeroplane-shaped body with a spring-based mechanical foot that propels the robot into the air. It could be used to improve search and rescue efforts by being able to navigate around obstacles and over rough terrain. Flying animals can be found everywhere in our cities, notes special-issue Guest Editor David Lentink, PhD, from Stanford University. “From scavenging pigeons to alcohol-sniffing fruit flies that make precision landings on our wine glasses, these animals have quickly learned how to control their flight through urban environments to exploit our resources. To enable our drones to fly equally well in wind and clutter, we need to solve several flight control challenges during all flight phases: takeoff, cruising, and landing.